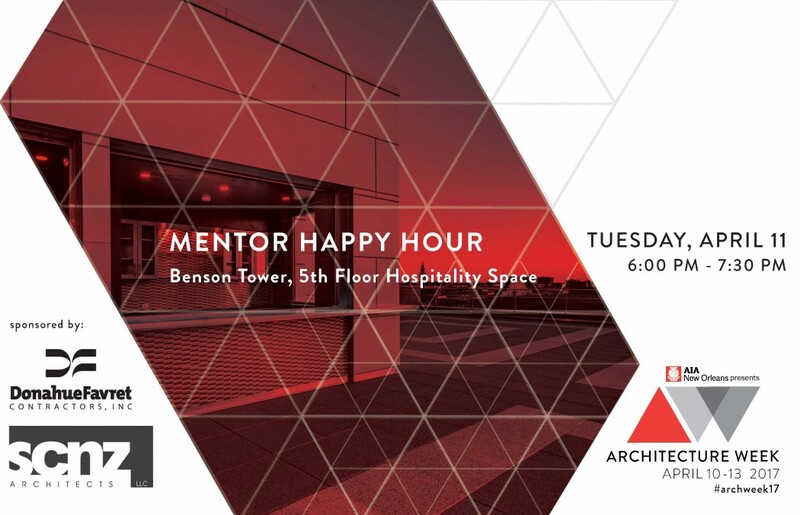 Join us for an evening focused on mentorship in the recently renovated Hospitality Space in Benson Tower. Mingle and share professional experiences with colleagues from firms across New Orleans while enjoying the view of the New Orleans skyline at dusk from the rooftop terrace. A 15 minute cocktail reception will begin at 6pm, followed by a series of 15 minute group mentorship table sessions focusing on a variety of topics. All are encouraged to attend as either a mentor and mentee. This event is part of a larger series of program for Architecture Week New Orleans, April 10 – 14, 2017 and is hosted by the Young Architects Forum and Associates Committees. Drinks and hors d’oeuvres will be provided. Thanks to our generous sponsors SCNZ and DonahueFavret Contractors, this event is free!